I came away from Sundance 2017 with a handful of real favorites that will stick with me throughout the year, and right at the top of the list was The Big Sick. Not only was it the best comedy I saw at the festival, it may be the best comedy of the year. And the reason why is that it's not only funny, but deeply personal, which helps it avoid many of the tropes it so easily could have fallen into. That's where Kumail Nanjiani and his wife Emily V. Gordon come in. The Big Sick is about their courtship, and the mysterious illness that Emily developed while they were dating. It got so bad doctors had to put her in a medically-induced coma. During that time, Kumail grew closer with her family. The film charts all of this, but also Kumail's standup comedy career, and the conflicts with his traditional Pakistani family. How does one go about making a movie about their own illness? Kumail and Emily have been together making people laugh for a long time, but this story isn't always meant to be funny. I had a chance to sit down and talk with them about The Big Sick, what went into their decision to tell this story, choosing Zoe Kazan to play Emily, and how this movie has affected them personally. 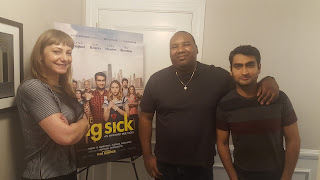 Check out the interview below, and my review of The Big Sick here!